Good afternoon! I have a card I am tickled purple about! I absolutely love coloring and crafting with purple and to top it off I am using Maja Design papers for the very first time! Can you believe it? I have loved the papers but never got around to making a purchase. I have been making do with what I have had in my hoarder's stash, lol! I have used Spring Basics 8th of April and 10th of April. You may be wondering who the lovely fairy is and she is the ever curious Teen Fairy Pia anticipating opening her present! You can find her and her just as gorgeous sister Teen Fairy Mia at Mo's Digital Pencil. I drew a present and colored it with Copics and framed it with a mini frame from my stash. I gessoed the Wild Orchid Craft flowers and added a scalloped envelope and tag made using my Silhouette. I totally forgot I had the pearl hearts from WOC and was so happy to rediscover them that I had to add some to my card. Absolutley stunning Danielle! I love shaped cards and of course Maja papers! Fabulous colouring and a cute image. Thanks for joining us at Divas by Design. Love the colors and the embellishments! Fab card! Thank you for joining us at the Cards Galore Encore Challenge #2 -Add a gem or glitter! Beautifully coloured! Love the little charms too. 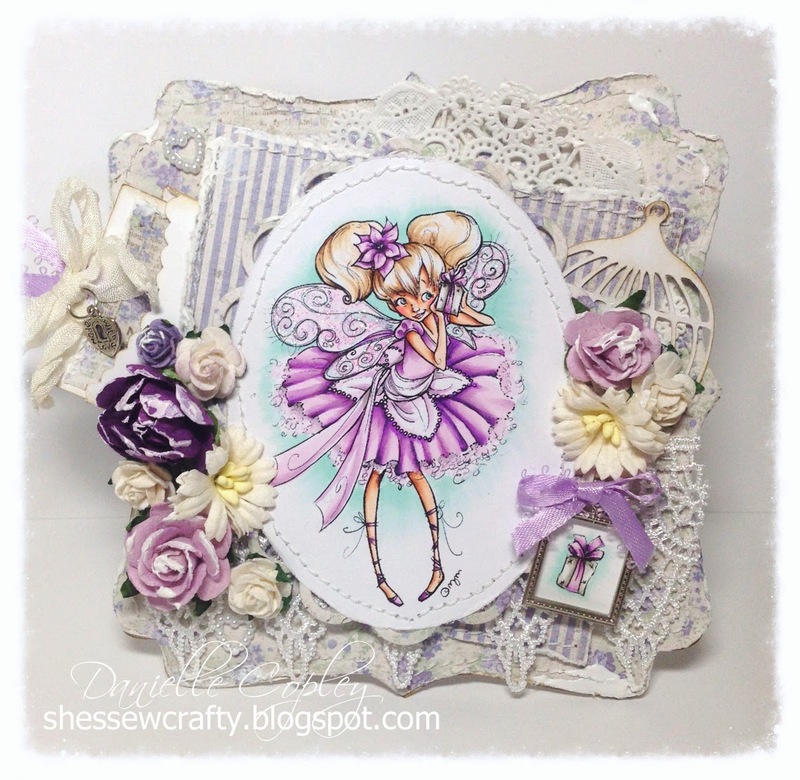 Thanks for joining the Crafty Girls Challenge, hope to see you again soon. My word Danielle. What a gorgeous card. Thanks for joining us at Color Me Creative. Wow stunning! I love the colors and all the details! Glad you joined us at CMC. This is amazing, i love the image & your colouring is superb.